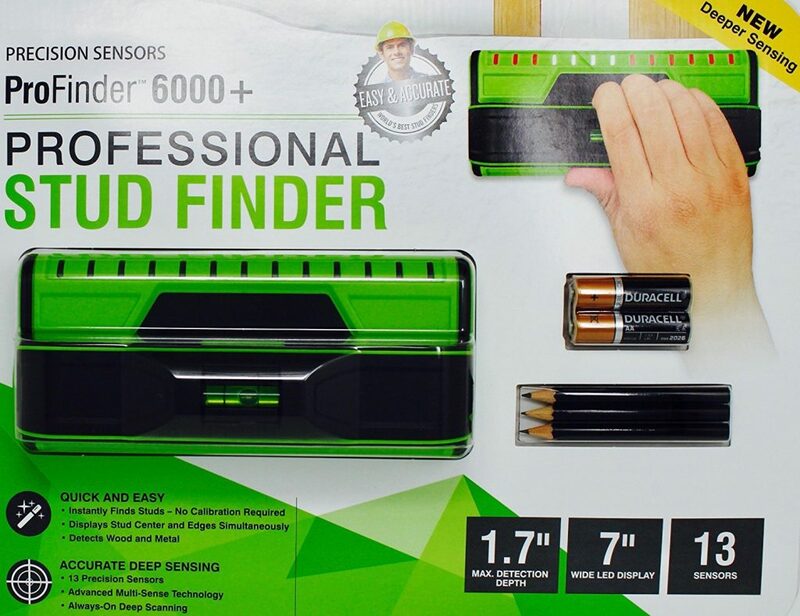 I recently saw the Profinder 6000+ at my local hardware store. It’s larger body shape caught my eye, and I decided we needed to review it. Stud finders make our lives easier but they aren’t “magic wands”. Cheap stud finders rely purely on the magnetic attraction of the nails in the stud. This means that their accuracy is limited by the size of the magnet. Ch Hanson still makes a magnetic stud finder that works well for finding nail heads, but it still operates on a very narrow width. Higher end stud finders (which the Profinder 6000+ is), measure the density changes in the wall to locate the studs. However, they are not perfect in that they often sense studs before they begin and after it ends. This creates a “bigger” stud, causing you to still have to create a few holes before you find the stud that your finder said was there. These other stud locators can also miss studs. In most cases, you are going to press the stud finder against the wall and slide it until it finds the stud. This sliding action helps calibrate the finder by letting it hone in on the empty space between studs before it transitions to a stud. However, you can start your finder directly on top of a stud, and this messes up the “calibration,” forcing you to do a few more passes until you get a more accurate reading. Most wall scanners require a certain level of skill to get accurate readings. The first significant advantage is in the wider (7 inch) design. This design means that you scan the wall in bigger swaths at a time, reducing the amount of “sliding” that you need to do to quickly locate and detect wood in the wall. It also gives you a more comprehensive picture of the area in which you are working. For example, you might have multiple studs right next to each other, or one stud that is 3 inches away from another one. The ProFinder will pick that up instantly and display the two studs as separate signals. The wider measurement gives you more information to make better decisions. Along with the broader sensor path, the Profinder uses more sensors. It has 13 sensors which provide up to 1.7 inches deep of scanning ability. These sensors not only help increase the sensitivity of the scanner but also triangulate with each other to create a more accurate picture of the interior of your wall, allowing you to identify the center of the stud as well as the stud edges. The profinder can detect metal and wood studs. Among stud finders for home, this is one of the easiest to use for home improvement. Because of its unique calibration settings, it doesn’t matter whether you start the finder on top of a stud or a wall cavity, the detector can still find it. Even if you set it directly on top of a stud, it will show you where the stud is, locate the edges of the stud and show you where the blank spaces are. Since the Profinder can show you the complete stud, it tends to give you more confidence. You don’t have to keep sliding back and forth across the stud and take multiple readings as you do with other stud sc. All you do is hold it up and mark the start and the end of the stud. It also includes a small builtin bubble level and an integrated ruler. Once you find your stud, you can use the Profinder to mark the wall and create level lines. It does not have live wire detection like the higher end professional electronic stud detectors have (such as a Zircon Multiscanner) but for an at-home device, this one is extremely sensitive. Note: If The Profinder 6000 is out of stock we recommend the Franklin 710 which appears to be a rebranding of the same product. 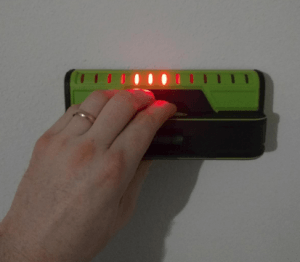 Often folks are shopping for a new stud finder because their current, $100 contractor-level finder is struggling. This scenario happens a lot in remodels of older homes. Plaster and lathe walls are especially challenging for these finders since the wall has notoriously uneven dielectric flows and it causes multiple false positives. The Profinder has a hit and miss track record with plaster and lathe. You are going to need to move more slowly and take multiple measurements. However, if you can keep the finder flush against the wall while you work, you should be able to get enough readings to understand where the studs are. Considering just how challenging it is to work through plaster and lathe walls, this finder is probably going to be way better than about any other on the market in this scenario. Just plan on it being less than perfect. Finally, we have found what may be this finder’s Achille’s heel. It seems that carpet, padding, and underlayment is just too much for it. It struggles to find the studs under carpeting. Weirdly enough, while this finder outperforms most other scanners in normal wall conditions, it definitely seems to struggle with the carpeted scenario. Working through tile and concrete board is hugely challenging. Not only do you have a greater thickness with these walls than you do with a basic sheetrock wall, but you also are dealing with multiple materials, each with a different dielectric constant. These tile wall scenarios can wreak havoc with the best sensors. Shingles and Siding are another one of those scenarios where you have a lot of different layers stacked against each other and it makes it difficult for the scanner to accurately read the dielectric differences. With vinyl siding, there is a small air gap underneath the siding and this makes even professional stud finders almost worthless (thankfully, you’ll probably pull the siding off before making any cuts) for locating studs. But don’t choose this scanner if you are doing a lot of exterior work. The external appearance of these two are very similar. In fact, if you decide to splurge for a padded case to protect your investment, the same case will fit either one. The Franklin Sensors Prosensor 710 advertises a shallower depth of finding (1.5″ to the 1.7″ advertised on the ProFinder 6000+). Otherwise, there is a lot of documentation on the Franklin 710 that is lacking when compared to the ProFinder 6000+. Maybe there are some patent wars going on, but these two finders appear to be very similar. I’ve seen other bloggers refer to them as the same thing. Update 4/16/2019: It appears that the Profinder 6000 and 5000 has mostly been discontinued and the Franklin 710 is now the default device that is being sold. These two units look very, very, very similar. They appear to weigh the same and have the same dimensions. They both offer 13 sensors that hone in on the studs. They each work without calibration. At this point, I’m guessing that there is either some major “wars” going on between former partners of these level companies and they each want to create their own, or the marketing team is running tests to determine if blue, yellow or green levels sell the best. I can’t find a difference among them. My advice? Buy the one which is most helpful to your pocketbook. The average homeowner would be hard pressed to find a stud scan tool they like better than the Profinder 6000+ or that can scan deeper than 1.7 inches. AA batteries are included, although if you are going to use it a lot, I would invest in some rechargeable ones.